If you are not from Holland or Belgium, this is going to be an uninteresting story. It is about a guy who made some instrumental 45’s in the 60’s, that were used as tunes by pirate radio stations. These radio stations ( Noordzee, Veronica, Mi Amigo ) were extremely popular in Holland and Belgium in the 60’s and 70’s. And these tunes are part of the memes of everybody that grew up in that period. But of course the man who composed and recorded the songs, from which those tunes were taken, never was mentioned. I doubt if he ever saw any money. Only later, when people began mapping their youth, it turned out that many of the tunes came from the same guy: Andre Brasseur. 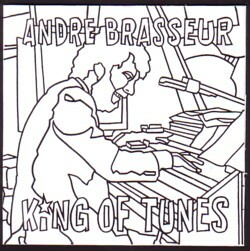 Andre Brasseur played a multi-sound organ, but there are other instruments on the songs too; I would not be surprised if he played all of them himself. I have most of the 45’s and some of his LP’s, but many are in a rather bad condition. These are records that people played when they bought them! There are several CD’s available from this King of Tunes, but you have to be careful: just like his LP’s, the CD’s are not all that great. You have to look for the original early songs, that were released on the Palette label.